Remember me? It's been far too long since the last post! Since I've been preoccupied with my small business, I've neglected poor MindfulEats. I've thought of you often, but Pop Karma has been all-consuming over the last year. Anyway, I'm back and I have a guest post on mental health that I've been meaning to share for many many months. We tend to focus on eating and physical health here, but mental health is just as important. People can often seek sympathy and support for physical diseases, but we tend to ignore mental illness. It is just as real and debilitating, but we often sweep it under the table and don't ask for support, or don't know how to discuss it with those that need it. As in any disease, professional medical help and treatment can be a lifesaver. Taking care of yourself physically also helps. My friend Jean asked me to write something on the subject of mental illness. So here I go. Do you know someone with uh…ahem…a mental illness? Are you related to that person? Well it’s not the end of the world, ya know. I speak from experience because I have a mental illness. I am a manic depressive, a.k.a. bipolar. I am 41 years old and was diagnosed more than 15 years ago when I was 25. I’ve spent almost half my life as a wacko. I wanted to reach out to those of you who know someone, or (gasp) are related to someone, who is crazy, nuts, bananas and don’t talk to him/her about it…because you don’t know what to say. Most of my friends don’t talk to me about being bipolar. It actually makes me sad because being bipolar is a big part of who I am. I went through a lot of personal angst and soul searching after I recovered from my first nervous breakdown and was diagnosed as a bipolar. Was I normal I asked myself? Granted I am now a highly functional bipolar. I am highly educated with three Ivy League degrees. I have a good job and own a home and a car. I’m actually on the Board of a non-profit dedicated to adults recovering with mental illness. I’ve being taking meds since I was diagnosed more than 15 years ago, and I’ve worked with my doctors to make sure that my meds work. Not all of us are like that however. When you see your friend/family member with mental illness, don’t worry about saying the right words. There are no right words. The most important thing is to say SOMETHING. Acknowledge it. An “are you okay?” goes a long way…a really long way. Ask about his/her doctor and the meds if you need to have something concrete to talk about. Something on the order of an Avatar-like “I see you” would be great but not necessary. I’d point out that it is important to try to be sensitive to your friend/family member. Some of us crazies don’t appreciate references to manic behavior or nervous breakdowns by people who don’t know what they’re talking about. The important thing is that you made an effort to talk to your friend/family member about their “illness”, and that’s a big deal. Remember that there is no such thing as normal. We’re all normal. Cleanses have been trendy for quite a while now. They can be anything from a juice fast (no food, only juices) to clean eating (no processed food). You can do it yourself, or you can follow a company's instructions. They usually last 3 days or longer. While I've been fascinated by cleanses, I've never actually done one. Fortunately for you, my friend Walter Frye did his second cleanse this summer and blogs about his experience below. People go on cleanses since they believe they are giving their body "a break" from digesting and allowing it to focus energy on ridding itself of toxins and healing itself. The medical establishment believes that cleanses are unnecessary since your body is built to cleanse and detoxify itself (through your liver, intestines, etc). If the idea of a cleanse interests you, and you want to re-set your attitude toward food, you may want to try a cleanse. MindfulEats does not endorse cleansing, but since different things work for different people, you may want to try it. Just research it first. When I was asked to journal my experience on the 3-day Organic Avenue juice cleanse, I was starving. It was day 3, which was by far the hardest. I decided to do a cleanse because I wanted to rid my body of all the toxins I've poured in, in the form of gallons of diet coke, fried food, and my other vices. Who am I kidding? I did it to kickstart my summer body and get rid of the last layer of fat stopping me from ab definition. I must say, to that end, this was a success and even though it was very challenging at times, I'd do it again. For me, the first two days weren't so bad, except for the 2-hour meeting that someone decided to bring freshly baked chocolate chips cookies to -- pure torture. I'll admit, many of the juices were downright gross, but I'd hold my nose, gulp, and feel relatively sated for while. Identify your goals. Some commonly stated goals for cleansing are to increase energy, eat more cleanly, jumpstart a change in your diet, etc. Research. There are many different types of cleanses out there - figure out which ones make the most sense. Talk to people that have done it, look at different companies, read some books. As your doctor. Some cleanses are the Master Cleanse, Clean, Blueprint. If you are still interested, cleanse. Follow the program that you've identified as being the best for you. You can do it yourself and create your own juices/food, which is cheaper (and you know exactly what went into it) or order from a program, which is more convenient. Here's a post on juicing yourself. Let us know how you're experience went! Diabetes is a global epedemic and one of the fastest growing diseases in America. Left unchecked, it will slowly kill and causes a host of issues on the way, including blindness, amputation of limbs, and heart disease. In 2006, one out of eight people in NYC alone had diabetes, and it is expected to grow at an epedemic rate. One out of three Americans born after 2000 are expected to be diabetic. Why is diabetes growing so quickly? Obesity and lack of exercise are some of the leading reasons. It's likely that you or someone you care about is/will be diagnosed with diabetes. The good thing is that a healthy lifestyle and being mindful about diet and exercise can help manage, cure (Type II only) or prevent diabetes. Dr. Edward Tsai of Las Vegas, NV (who happens to be my brother) says that losing weight, exercise, and maintaining a healthy lifestyle can cure 95% of Type II diabetes. How much exercise is needed? 150 minutes a week (according to SparkPeople). Diabetics have high blood sugar. There are traditionally two different kinds - Type I and Type II. Type I used to be known as juvenile diabetes since it is commonly diagnosed in children and young adults. In this case, the body does not produce insulin. This type of diabetes is genetic and not curable, but can can be optimally managed through insulin, diet, and exercise. Type II used to be thought of as adult diabetes where the body doesn't produce enough insulin or has stopped responding to it. However, there is more and more crossover as children are becoming diagnosed with Type II and Type I is being diagnosed later. Are you diabetic or do you care about someone with diabetes? Are you pre-diabetic? You know that diet is important. As is exercise. Recent published studies suggest that at least 150 minutes a week, or 20 minutes a day reduces blood sugar for Type II diabetics. The best exercise is a combination of both aerobic and weight-lifting. If you feel you can't manage it, it can be broken up in to 10 minute segments, and moderate exercise works if you can't get in vigorous exercise. If you are not currently diabetic, making sure that you are mindful of getting your exercise and what you eat can help prevent it. If you or someone you know has diabetes, make sure you are under the care of a doctor and understand what your regimen should be in terms of medication, diet, and exercise. Follow your doctor's orders and watch your diet carefully. Schedule daily exercise. If you are encouraging a diabetic, exercise with him or her. Move! Get at least 150 minutes a week, and make it a mix of aerobic and weight-lifting. Here's a post on Mindful Exercise. Rapid weather changes always seem to give people the sniffles. Our recent 30F to 60F to 40F degree temperature swings probably didn't help. Fortunately, there are some tried and true ways to ward off or shorten a cold, and a new study has added another weapon to the pantheon: ZINC! MindfulEats is a fervent believer in the power of Vitamin C and chicken noodle soup. We kind of poo-poohed zinc, but maybe it's time to check it out. A review on the medical research on zinc shows that if you take zinc within 24 hours of the first runny nose or sore throat, it can reduce the length of a cold by an average of a day and severely reduce symptoms. We're convinced that Vitamin C does the same thing, so maybe it's time to double up with zinc. Anyway, if you're as annoyingly whiny about being sick as we are, it's something to try. The recommended zinc dosage is 13 milligrams every three to four hours for four days, which results in 50-65 milligrams a day. If it works for you, then you've got a new tool in your arsenal! Admit you have a cold. This is the first and most important step. Don't lie to yourself and pretend you don't. If you have a slight sore throat or sniffles, that's not normal - it's an incoming cold. You can't prevent it if you don't admit it. Load up on Vitamin C. 2,000 mg after breakfast, lunch, dinner and before bed. Yup, that's 8,000 mg a day. And as much citrus as possible on top of the vitamins. C has fervent advocates (Linus Pauling took 6,000-18,000 mg per day) and ballyhooers. It's necessary for your body's function and is essential for healing wounds. There are many C skeptics that do not think it helps colds and think high doses are toxic. Vitamin C is water soluble, which means your body eliminates what it does not use through urine. C works for us and is the most important part of our regimen for killing a cold. We take megadoses when I'm sick, but don't take it as a supplement otherwise. Try zinc. Have 13 milligrams on the same schedule as the Vitamin C, for a total of 50-65 milligrams a day. Lots of Vitamin C tablets include zinc, or you can try lozenges or syrups. Eat chicken soup. It works. The University of Nebraska published a study in 2000 that demonstrated efficacy. Even out of a can. Drink lots of water. You're getting dehydrated, so drink up. Make hot herbal tea with lots of lemon and honey. You can also try the Taiwanese remedy of just hot water, lots of lemon and honey. Exercise. You might be fatigued, but we find moderate exercise seems to clear the congestion. So do these studies. Go to bed early. Your body needs the rest. Figure out what works best for you, and use it as a blueprint everytime you sense a cold coming on. The NYT article on zinc that inspired this post. Original MindfulEats post on quashing colds. Have you ever had a really great massage that leaves you feeling fabulous for days? That's because it fixed something that was tweaked - muscles, fascia or energy. My first massage was from Madonna's massage therapist. Susan was a friend of a friend, and though I felt good, I didn't feel amazing. Maybe because I was new to massage and it made me a little nervous. Still, I kept hearing that massage is amazing for your health so I kept trying. Since then, I've gotten massages around the world from Hungary to Cambodia. I've had some great ones (the best ever was by my surf instructor Kim) and lots of mediocre ones. But in the last two years, I've found an amazing massage therapist who is priced right so I try to go every other week. Massage is an ancient form of therapy that has been around for thousands of years. Today it is recommended by doctors, and can be reimbursed by insurance. It can help relieve pain, increase immunity, reduce stress, improve your energy flow and leave you feeling more energetic and relaxed. The benefits of a few treatments can last up to a year, according to Partap Khalsa, PhD at the National Institutes of Health. There are many different types of massage, but they spring from two "schools" or modalities - western and eastern. Western massage (e.g. Swedish, deep tissue, sports) is more focused on the body, and Eastern techniques tend to be more physically vigorous and focused on improving energy flow (e.g. shiatsu, acupressure, tui na). I started out getting fancy spa massages in Western modalities. They were very relaxing, and always left me feeling heavy and ready for a big nap. The effects never seemed to last - the next day it was back to usual. Then a couple years ago, a friend recommended shiatsu at Fishion in NYC Chinatown. It was different in all ways. It was extremely painful - nothing relaxing about it. I could barely take it. But 2/3 of the way through, I realized that my body felt light. When I got up, I felt light and energetic, and this amazing feeling lasted for days. The massage actually felt therapeutic - almost medicinal. The actual facilities were bare bones - the private "rooms" weren't really rooms, rolls of paper towels subbed as cushions, and there was no aromatherapy. You could hear the person next door. It didn't faze me since I was all about the massage, and the lack of decor contributes to the very reasonable price ($40/hour). I tried out different massage therapists and found three that are absolutely amazing that I recommend to everyone: Jessica (my regular therapist), Janet and Fang. If you're in NYC, Fishion is at 107 Mott Street. Make sure to tip your therapist well for the magic she/he provides. Find a great massage therapist. Massage is only as good as the person giving it. Ask for recommendations, or go online and read reviews for different places. Try different massage therapists until you find one that works wonders for you. Get a series of massages. To get better value, you can sometimes prepay for a series of sessions. Ask. If you're looking for more affordable massages, you can try a local massage school. Once you find a massage therapist, note how you feel before and after the massage. Be mindful of the effects. First timer? Relax. Let the massage therapist know. You can undress to your undershorts or be fully naked as you will be under a sheet. If you are doing acupressure or shiatsu, you can wear a t-shirt and shorts if you would like. Try self-massage. You can always give yourself spot relief (see the link below). Reduce Chemicals to Reduce Cancer? We don't need any medical studies to prove that. But, in April 2010, the President's Cancer Panel linked cancer to chemicals and made all the same recommendations that MindfulEats does. The Panel was established in 1971 to report directly to the President of the U.S., and they report their findings at least once a year. Their last report states that more than 80,000 chemicals are in use in the U.S., and only a few hundred have been tested for safety. Be especially vigilant keeping toxins away from children. They are far more susceptible to damage from environmental carcinogens and endocrine-disrupting compounds since their little systems aren't fully developed. All the following recommendations are especially important for kids and pregnant women. Remove shoes before entering your house and wash work clothes separately if you are exposed to chemicals at work. Drink filtered tap water instead of bottled unless your tap water is known to be contaminated. 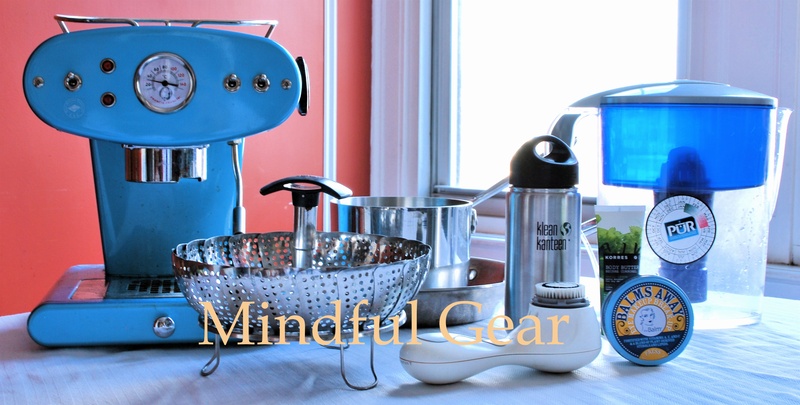 Store or carry water in stainless steel, glass, or BPA- and phthalate-free containers. Microwave in ceramic or glass containers instead of plastic. Eat organically grown food to avoid pesticides, herbicides and antibiotics. We aren't convinced the regulation of organically-labelled food is all that great, so it's best to buy direct from a trusted farmer if possible. If you can't buy organic, you are getting all the nutritional value from whole, non-processed foods anyway. Roger that. Use green cleaners. Or check them out in the Household Products Database to get less toxic ones. Dispose of pharmaceuticals, household chemicals, paint, and other chemicals properly so they don't leach into our water and soil. Turn off lights and electrical items to reduce exposure to petroleum combustion by-products. Take public transportation, bike or walk when possible, or drive a fuel-efficient car to reduce the amount of toxic auto exhaust. Or car-pool - it's social and green! Don't smoke and avoid second-hand smoke. For a blog festival on real foods, visit Food Renegade.